The bookmark on top does not have the attribution. Alas, this is the collection that I slid into an envelope to send to Sarah Bodman in the UK for Bookmarks XV. There are 100 bookmarks, signed and numbered. 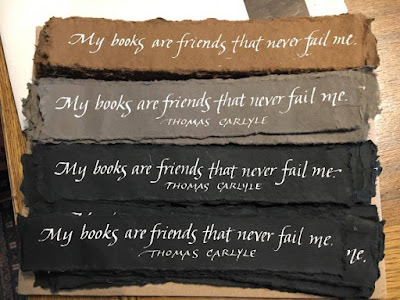 I counted them multiple times, looked at them multiple times, and it wasn't until I saw the photograph of them, after I had mailed them of course, that I noticed that the top one was missing Thomas Carlyle's name. Grrr. Each one was hand-lettered with Dr. Martin's Bleedproof White on torn strips of Shizen Design handmade paper from India that is 100% recycled from post consumer waste. I love Dr Martins Bleed Proof White but these days most often use Golden Titanium White fluid acrylic, a very dense white with better flow! I'll have to try that. Thanks for the tip.